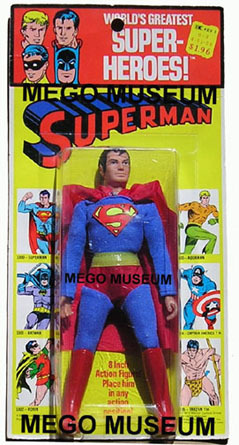 It’s no surprise that Mego would start with the character that truly originated the word “Superhero” in the first place. 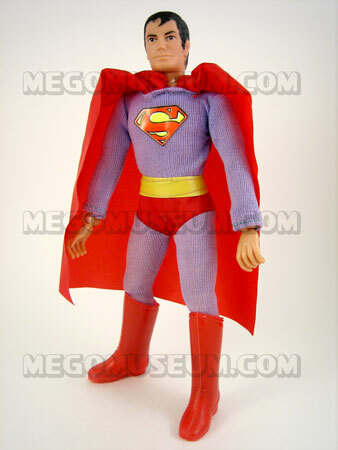 Superman was also the first Mego WGSH ever produced as evidenced by the Prototype Superman featured in the 1973 Mego catalog. 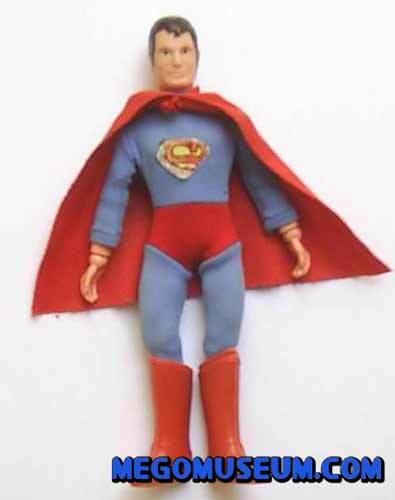 Superman remained in the WGSH offering from the beginning to the end. 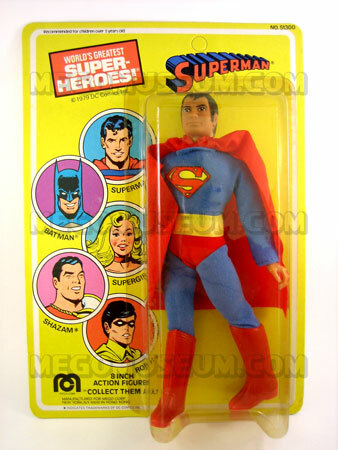 Unlike Batman and Robin, who share that distinction, Mego Superman was the only figure who stayed essentially the same. 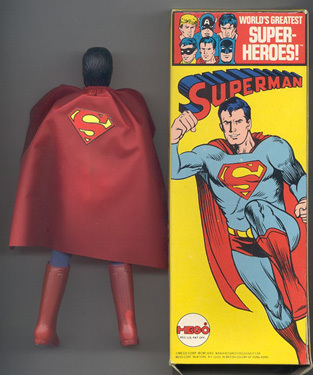 Because of Mego running the same character for nearly ten years at different production facilities, there are some minor variations of Mego Superman in material texture, though no vinyl capes have been discovered. 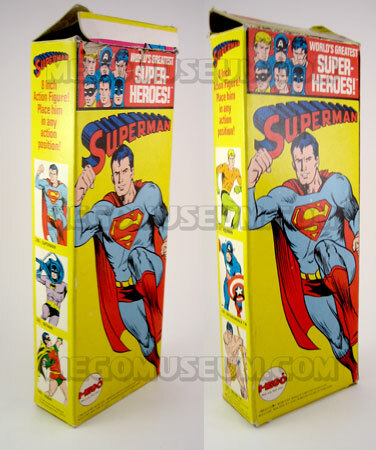 The major variation is the Large S Solid box/Kresge Superman (see below). 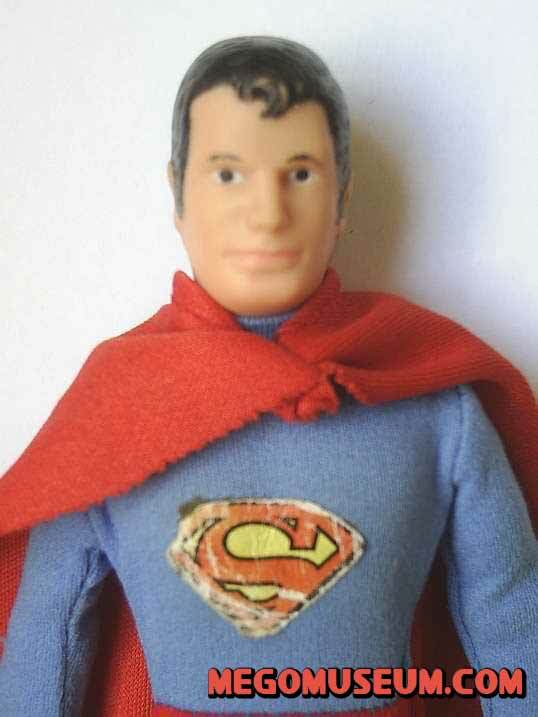 This Type 1 Superman is in a costume that appears to have faded to lavendar. 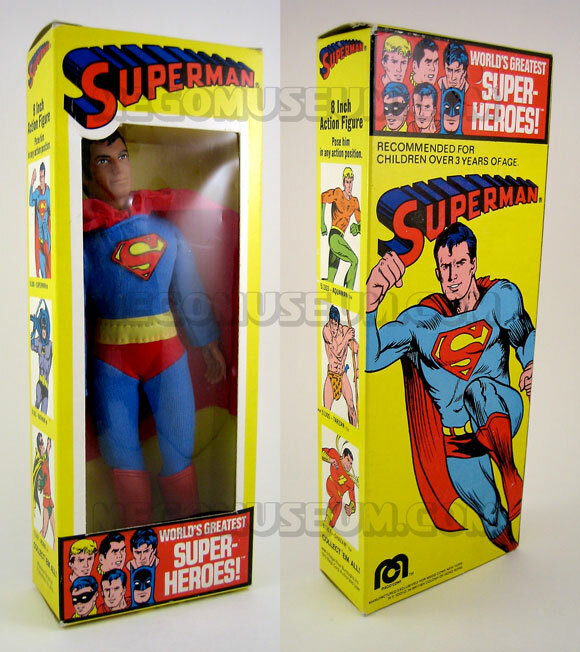 12 Inch and Pocket Superheroes galleries among others for more Mego Superman. 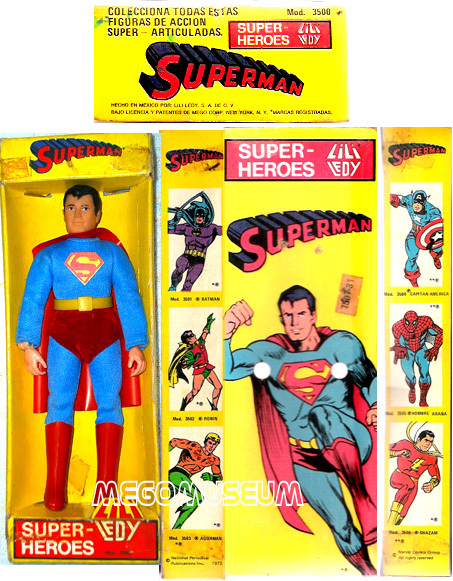 A number of Superman figures were produced in other formats by Mego. 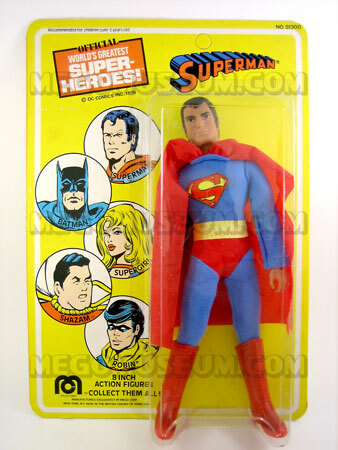 Of particular note would be the Super Softies , Bend N Flex and Comic Action Heroes but if it was a Superhero item made by Mego, Superman was there. as Removable Cowl Batman. 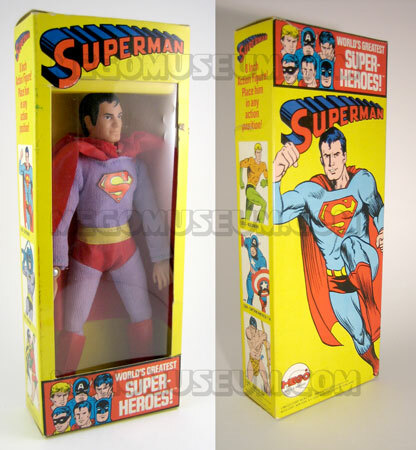 Mego VP Neal Kublan mentions that early Superman figures were being sent from Hong Kong with “S” upside down, regrettably as of this writing, no examples exist. The front and back of a solid box are identical and match the back of a standard box. Identify at a glance by the placement of the flap. This first version Window box features Captain America on the masthead and Cap and Tarzan on the sides. item code (1300, 1301, etc) have been updated with a 5 (5/1300). 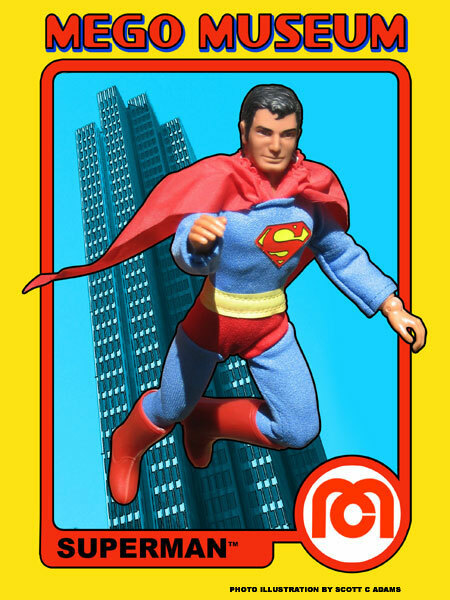 The next Kresge Card in this progression shows the two newest heroes to the Mego Roster, Captain America and Tarzan. 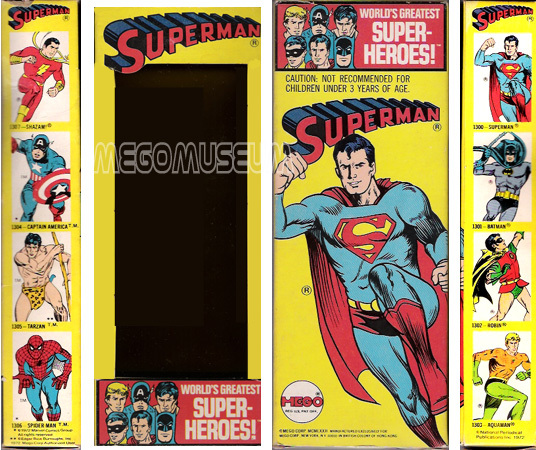 As with all Mego WGSH packaging, the artwork would be further altered to not have the DC and MArvel heroes intermingling. The estate of Edgar Rice Burroughs seemed to have no problem with Tarzan sharing the spotlight with Superman however. 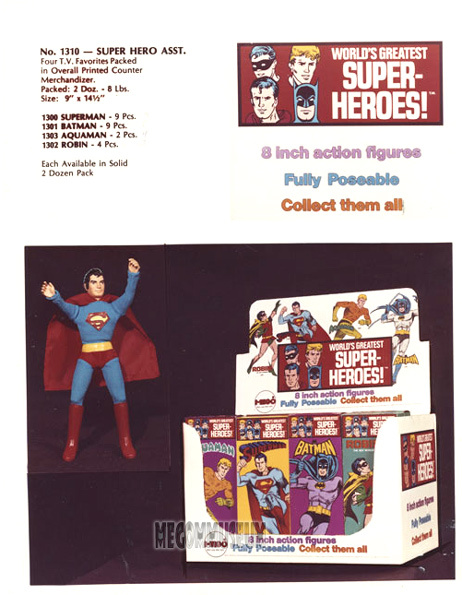 Later Kresge cards (not shown, yet) would have revised headers to feature Green Arrow and would contain a type 2 Superman, we are working on bringing those to you. after by collectors and is not commonly found. this unique die cut card. 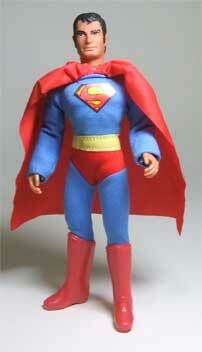 BASA made three heroes for the Peruvian market including Superman pictured here courtesty of Rudy Zerbi. 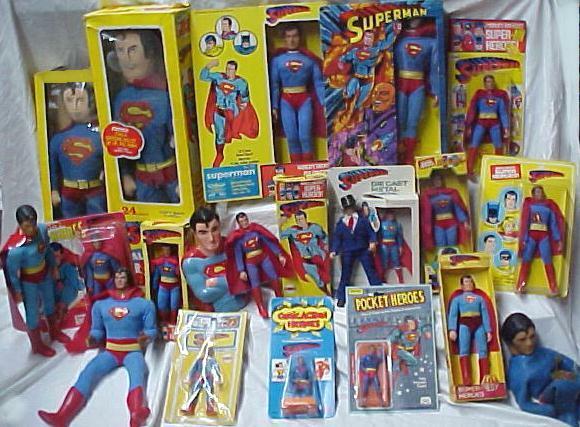 The Japanese Superman box. 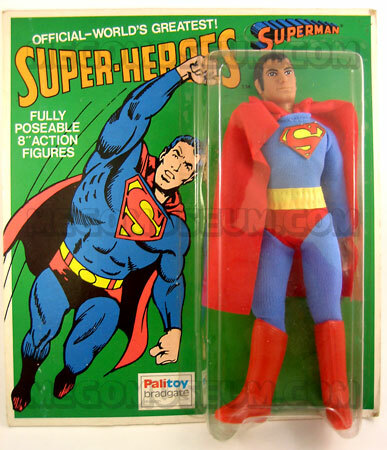 Distributed by the Popy Company of Japan this box bears no mention whatsoever of the Mego Corp. 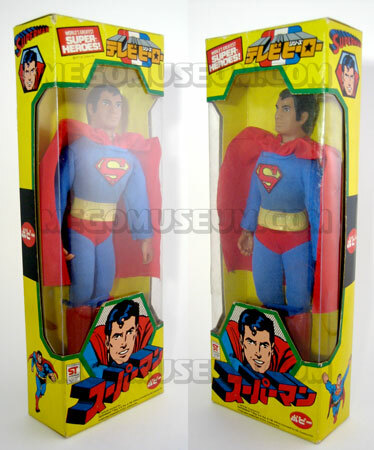 These are standard Megos. 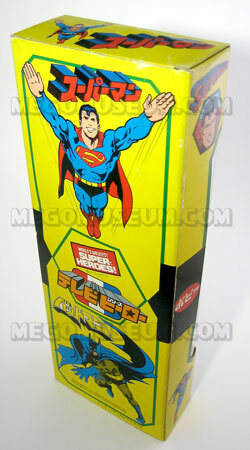 Look in the Spiderman and Batman Galleries for more Japanese packaging. 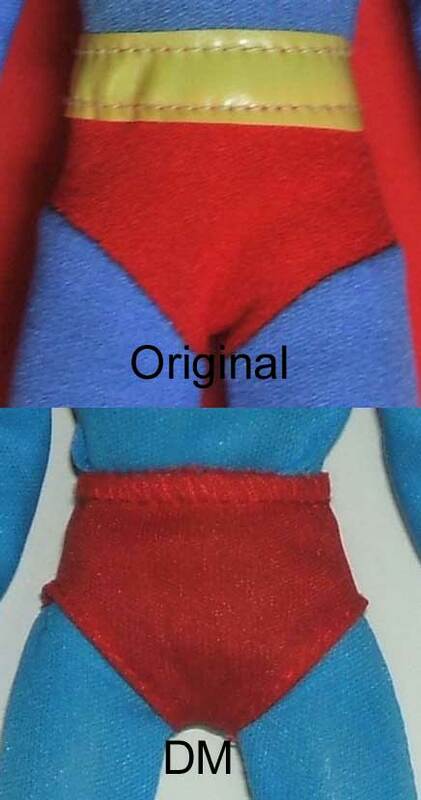 All original Superman suits (whether nylon or cloth shorts verions) have shorts sewn into the jumper. Doc’s factory made version is two pieces, a blue jumper, and a red pair of Robin style shorts over top. The jumper is marked DM, the shorts are not marked. Superman had a couple different emblems. The rare find is the large S version, which is much bigger in size. The standard version came in paper and cloth. There are a lot of high quality home made paper and cloth emblems out there, but Doc’s in the only factory made version. It’s a paper die cut and actually looks much cleaner than the original paper version, which tends to look like a bad print job. There are two types of Superman boots. The early versions came with what is called the “skinny” boot which is more narrow than the later standard hero boot. Both DM and CTVT have made boots and they vary a bit in shape compared to the original standard boot. Doc Mego’s are stamped DM on the bottom. CTVT’s are unmarked. Clark Kent and Superman share the same head. 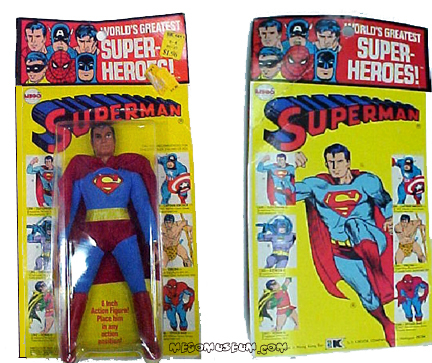 An orginal CK head is unmarked while an orignal Superman head is marked with the NPP DC copyright info on the back of the neck. 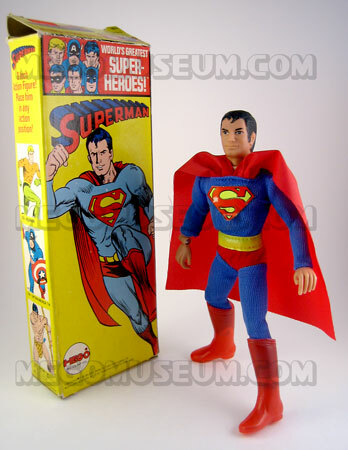 The head has been reproduced by Doctor Mego. The DM version is a firmer plastic, less flexible. It is also thinner in the face. It is marked DM on the back of the neck. 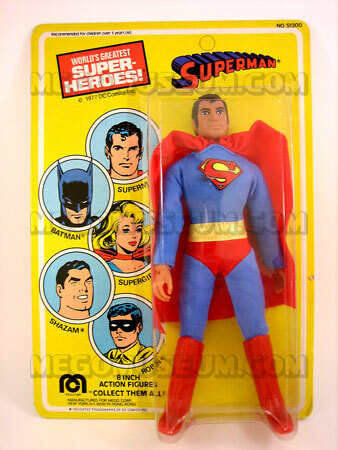 It should also be noted that Mego used the Superman/CK head for Dinah’s boyfriend Don. 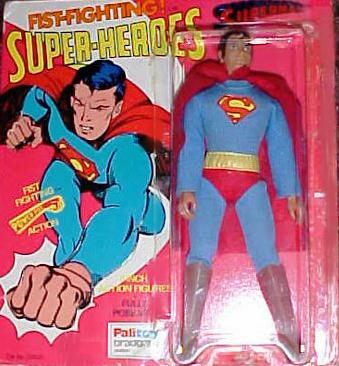 Like Clark, the Don version also has no copyright information on the neck.